Day 1 of the IIndustrial grinding equipment worked through the night to add abrasion to the troubled area of the Anhembi Sambodromo frontstretch area. On Sunday, after a brief warm-up for IndyCar race teams, the work done by track crews received the rave appreciation of competitors. Reconciled with the Sao Paulo street course, drivers and teams readied for the early morning qualifying. In the time trial session, Dario Franchitti pulled out a 1 minute, 27.7354 second lap time to take pole. In an astonishing development for the series debuting #77 car of FAZZT Race Team, Alex Tagliani delivered a run just 3/100ths of a second slower than Franchitti. Justin Wilson, Ryan Hunter-Reay, Will Power and Tony Kanaan rounded out the starting order for the first ever Sao Paulo Indy 300 race. 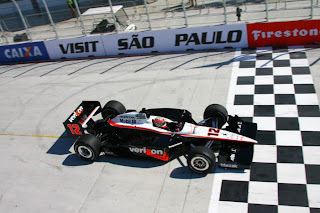 Just four hours after Franchitti posed for his Peak Pole Award, the #10 Target/Chip Ganassi car led the 24-car field to the start as both the San Paulo Indy 300 and the 2010 IZOD IndyCar Series were a go. However, just as the 24 IndyCar race competitors took green, a multiple car pile-up resulted just 10 seconds after the race season started. Involving 5 cars in total through the turn 1 area, cars of Takuma Sato, Helio Castroneves and Scott Dixon were caught in one tangle which ultimately resulted with only Sato race ended. In a second more scary collision, the #32 KV Racing Technology car of Mario Moraes was launched onto Marco Andretti's #26 car. Fortunately, Andretti stepped out of his Venom-sponsored race machine uninjured. 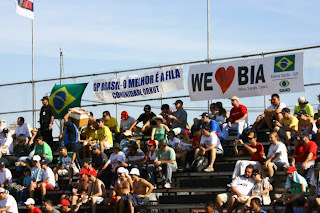 With the first 7 laps run behind the safety car, the Sao Paulo Indy 300 restarted as pole sitter Dario Franchitti led the first green flag laps pulling out a 1.4 second lead on 2nd place runner Alex Tagliani. After starting on the front row, Alex Tagliani and the FAZZT Race Team were settling into their first race together running 5th after the first set of pitstops. Tagliani would see his respectable running run take a turn for the worse his #77 Bowers & Wilkins car was collected in a lap 29 coming together with Tony Kanaan and Dan Wheldon. While Wheldon and Kanaan continued on the way, the FAZZT Race Team machine of Alex Tagliani would be unable to continue finishing 17th in their first race of 2010. Dan Wheldon, driver of the #4 Panther Racing Dallara/Honda, would assume responsibility for the incident after the race. Blazing to a strong run in practice in day 1, the #37 Andretti Autosport racer of Ryan Hunter-Reay followed up his Saturday afternoon performance by taking the lead of the race on lap 28. Leading 20 laps on the day, Hunter-Reay has emerged as a definite factor at this point in the Sao Paulo Indy 300. By lap 32, a thunderstorm blew heavy rainfall through the area soaking the temporary race track causing at first a caution to fly as the #7 of Danica Patrick and the #32 car of Mario Moraes spun in the 1st and 2nd turn. As drivers encountered impossible racing conditions due to the flash storm creating deep pools of standing water, the loss timing and scoring through an electrical power outage necessitated a red flag. Through the red flag break, the toll of the temporary street course was evident with the physical wear placed on the IZOD IndyCar Series drivers. In the case of Will Power, bloody blisters were seen on the his hands. The rain died quickly and the Indy cars returned to competition after a 36-minute interruption, a two and a half time limit in place at the street course, the full 75 lap distance could not be run in the allotted time. forced the event to become classified as a timed event with under 40 minutes left to run. While Dario Franchitti retook the lead briefly on the lap 37 restart, the Chip Ganassi-owned race machine relinquished first place when Franchitti pitted. As a result, the he lead returned to Ryan Hunter-Reay who was attempting to stretch his #37 car's fuel mileage to the race's end distance. Having to run a slower pace, the Andretti Autosport car soon came under attack from two Penske Racing vehicles, Ryan Briscoe #6 and Will Power #12 cars. On lap 50, amongst a fierce fight between Hunter-Reay and Briscoe, the lead changed as the #6 prevailed. As Ryan Hunter-Reay was still marginal on fuel, the Andretti Autosport driver did not back down and continued to apply pressure to Ryan Briscoe. With time ticking down on the race, the outcome changed as Ryan Briscoe miscalculated turn 5 braking nosing his #6 Penske Racing car into the tire barrier. The resulting yellow flag not only put Ryan Hunter-Reay back into the lead, the brief caution period eliminated fuel mileage concerns. With time which would measure 6 laps remaining, Hunter-Reay's fight came from a hungry Will Power. With 3 minutes and 30 seconds still on the clock, Power used some skillful car control to beat Ryan Hunter-Reay through turn 11 successfully pulling away to win the Sao Paulo Indy 300. Will Power's second win in the IZOD IndyCar Series, this victory reinforced Roger Penske's wisdom to expand his open wheel team to 3 cars for 2010. Though Ryan Hunter-Reay lost the Sao Paulo Indy 300 trophy in the latter stages, the American open wheel driver matched his first race finish last season at St Petersburg. With Andretti Autosport in 2010, Hunter-Reay has the opportunity to follow-up his initial finish through the duration of the IZOD IndyCar championship. With Will Power healed from a severe back injury, two of the three members of the Sao Paulo Indy 300 podium. A fantastic run for the #14 AJ Foyt Enterprises race team, Vitor Meira finished 3rd in his return to IndyCar competition after serious injuries suffered in the Indy 500 last May. Meira's 3rd place run was also made him the highest finishing Brazilian driver on the Sao Paulo circuit. Also a news item was the record female contention in the race with Danica Patrick, Ana Beatriz, Milka Duno and Simona de Silvestro all starting in this IndyCar round. Finishing the best of the racing women, rookie Ana Beatriz driving for Dreyer & Reinbold Racing for her home event came home on the lead lap in 13th place. Acknowledged only as a one-off ride for the Sao Paulo IndyCar race, it will not be surprising if Dreyer & Reinbold Racing or another team will extend the young Beatriz more opportunities this season to run the series. Swiss driver Simona de Silvestro also had a memorable first IndyCar race of her career placing the HVM Racing car in the lead briefly through as the field was sorting through the first set of pitstops. Having signed with Dale Coyne Racing just 11 days ago, Milka Duno would be the only woman not to finish the Sao Paulo Indy 300. Duno spun her CITGO-sponsored car in turn 3 on lap 22 stalling the vehicle. The next race for the 2010 IZOD IndyCar Series will take place on the Streets of St Petersburg on March 28th.